We were proud to hit many great milestones in 2015, including hosting more than 43,000 of you at 30 race events!! As we reflect on the year and prepare for a busy 2016 race season, we have much to thank you for. Your commitment to step up for charity and community was once again much appreciated. 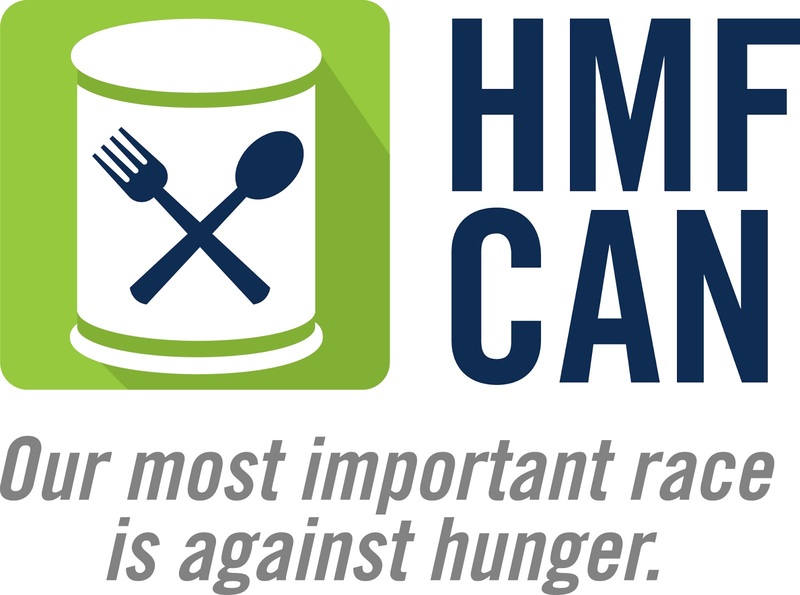 For the inaugural HMF Can initiative, runners helped raise more than 10,000 pounds of non-perishable food to donate to local communities we race in. Of note, more than 900 pounds was donated to the Amazing Grace Food Pantry through the Harvard Pilgrim Middletown Half Marathon in April - reportedly their biggest ever one-time donation. A 2016 goal has been set to collect 12,000 pounds, with your continued support. But you’ve said it best through the year! In your words, hear a little more about what it meant to race HMF Events. It’ll give you great motivation and us many reasons to keep trying to do more and better in 2016! For more information on 2016 events or to register, please visit www.hartfordmarathon.com and be sure to follow on Facebook at HMF Events, Twitter at @runHMF and Instagram at HMF_Events. We are excited to announce a new partnership with Fleet Feet West Hartford as the exclusive run training partner for HMF Events in central Connecticut. With new and expanded group training programs leading up to key events and series, we’ll support you to achieve your goal – and celebrate you at the finish line! Keep motivated through the winter with the 12-14 week half marathon training program that starts January 2 or January 16 and gets you to the finish line of the Harvard Pilgrim Middletown Half on April 3. Based on the principles of the Run S.M.A.R.T. Project, this coaching program is customized to your personal fitness level factoring your training goals. The program incorporates the VDOT Running Calculator and interactive online calendar and running logs that you and your coaches track to keep you accountable and motivated. With 5K group training programs starting January 9th and 10th to prepare for the March O’race Trinity Series events, Fleet Feet will be offering three different levels of training to suit every age and ability level. The 11-week training programs provide experienced coaches, camaraderie in a supportive group setting and training guides for each participant. The No Boundaries 5K - Intermediate level is great for those who have competed in 5Ks and are looking to run longer intervals during training or challenge themselves with new race goals. Be sure to encourage your non-running friends to consider a Walkfit or beginner No Boundaries 5K group to join you at the Courthouse O’Putnam, O’Niantic or O’Hartford in March. Check back for more programs, or please feel free to connect directly via the Training Program Inquiry link if you are seeking a specific training program that you don’t find available. We are excited to offer the Eversource Hartford Marathon as part of an enhanced "New England Double" 2016 marathon package, together with RunVermont, producers of the People’s United Bank Vermont City Marathon. Please note, the registration process for the program has been updated. 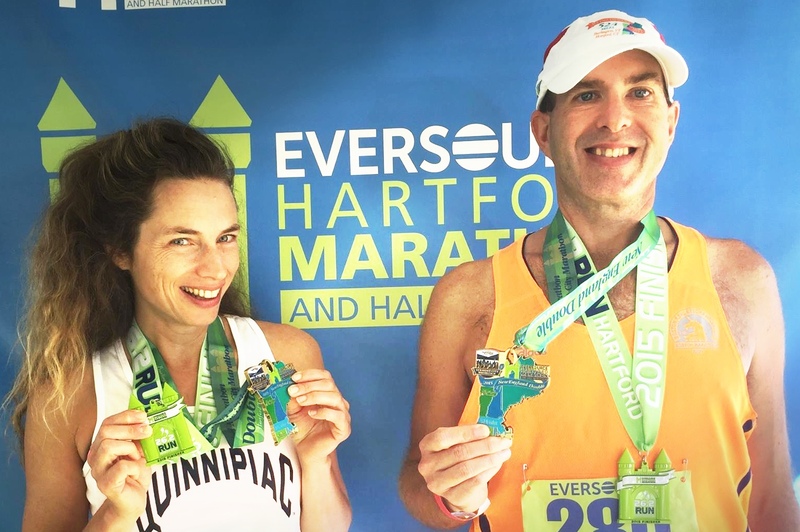 Runners earn the “New England Double” distinction by completing the May 29th People’s United Bank Vermont City Marathon and the October 8th Eversource Hartford Marathon. Those who register for the program and finish all 52.4 miles will receive a special New England Double medal (in addition to earning event finisher medals) and a commemorative finisher jacket. You must register for both events directly on our respective race Web sites and then simply choose the option to add the New England Double program within each event’s registration process. Once you register for both events with the option, you’re in! If you already registered for the New England Double program but were cut off from finishing on 5/29 due to the extreme weather, you will still be included in the program as long as you passed the 13.1 split time. If you ran in Vermont and want to add the New England Double but have not registered for the program yet, you may add the New England Double through the Eversource Hartford Marathon registration process. There are no event or race distance substitutions allowed. You must complete both the People’s United Bank Vermont City Marathon and the Eversource Hartford Marathon to receive the New England Double medal and jacket. Participants must register for the Vermont City Marathon before it sells out or by May 29, whichever comes first - don't delay if you want to run the Double! 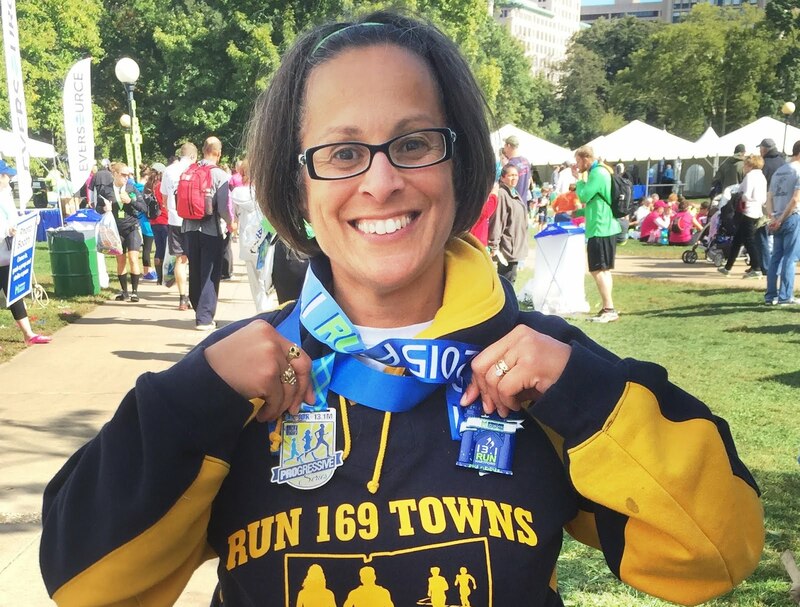 New England Double medals and jackets will be available for program participants to pick up in Bushnell Park after they finish the Eversource Hartford Marathon on October 8. Whether your goal is a first half marathon or you’re looking to improve time, our 3-race “PRO Series: 5K to Half” will help you achieve it - with some extra incentive! Earn a commemorative series medal and get a free training guide for support (optional coached group training is also available). Choose either the Red Dress Run for Women on July 9 or Rentschler Airfield 5K on July 14 as your first race. You will then run the Old Wethersfield 10K with us on August 28 – this double-loop course is flat and fast, a great way to increase race mileage in preparation for your final race. Follow our weekly mileage guide to help get you to the finish of the October 8 Eversource Hartford Half Marathon. You must register for the PRO Series: 5K to Half program to participate (do NOT register for events in the program individually). Simply click the option for PRO Series: 5K to Half registration within any one of the participating events and you will be registered for the program and all three events simultaneously. You must register for the PRO Series: 5K to Half before the second 5K option on July 14 or before any of the participating events reach capacity, whichever occurs first. You may not combine promotional programs with overlap events – for example, you must choose between participating in the Pro Series: 5K to Half OR the Triple Half Challenge promotion. There's also an an option to participate in a more robust group training program (fees apply), which provides experienced coaches, a supportive group environment and a training program shirt. Details on PRO Series group training will be provided shortly. Collect your medal on October 8 – a festive finish line awaits you in Bushnell Park, with incredibly supportive crowds, great course amenities and a huge post-race bash! Register for the Series by January 22 to receive personalized bibs for all three races! Series participants will also be provided exclusive new race swag. 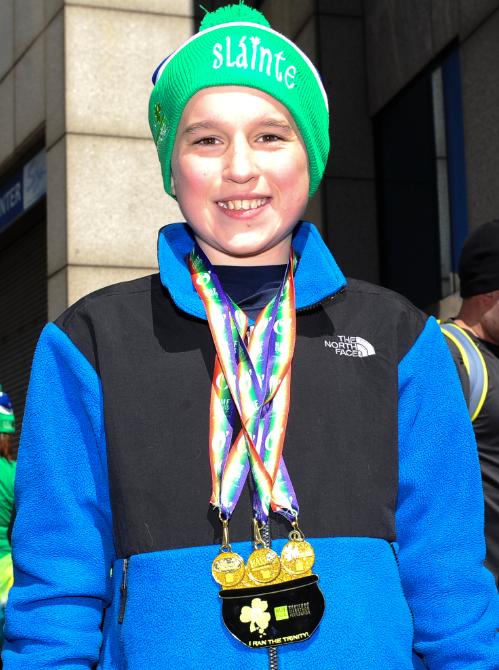 Instead of receiving a beanie hat at each event, O’race Trinity Series participants earn a beanie hat at the Courthouse O’Putnam, socks at O’Niantic and gloves at O’Hartford. We’ll deck you out in St Patrick’s Day-themed running gear (supplies limited, register early to secure your swag!). The VIP option can be purchased within the race or series registration process or added through the ShopHartford store if you choose to purchase after you have registered for the event (available until max capacity is reached). Get your Irish on with us in 2016, and give yourself great motivation to keep up with winter training! If you joined an O'race in 2015, see if you made the photo slideshow below! Back by popular demand - the HMF Triple Half Challenge of 2016! We heard great feedback from this year’s inaugural program and want to give you the opportunity to best your 2015 time or join your first challenge. You must register for the Triple Half Challenge program to participate (do NOT register for events in the program individually). Simply click the option for Triple Half Challenge registration within any one of the participating events and you will be registered for the program and all three events simultaneously. Please note, you must register for the Triple Half before the first event on April 3 or before any of the participating events reach capacity, whichever occurs first. The only event substitution allowed is the replacement of the Eversource Hartford Half Marathon with the Eversource Hartford Marathon. If interested in this substitution, please select it from within registration options at the time of Triple Half Challenge program registration. Your Triple Half finisher medal and official jacket will be waiting for you at the post-race party of the Eversource Hartford Marathon on October 8th. The new “Spring Ahead: 5K to 10K” 3-race series will jumpstart your spring race season with two popular events and culminate in a brand new point-to-point 10K running Farmington to Collinsville. The progression from the 3.1 mile O’Hartford 5K on March 20, to the Legends 4-Mile in Middletown on April 3 and ending with the 6.2 mile Collinsville Classic 10K on May 1 provides an achievable and fun goal. Whether you’re a relative running newbie, you want to motivate yourself this winter with a new training goal or you're someone who has fallen off the race circuit for a while (as I like to lovingly call, a “USTA”), this series will give you reason to run - great courses and new bling, a commemorative Spring Ahead medal. And, our free training guide will motivate you to race beyond 5K or help ramp up your training for later spring, longer distance race events. You must register for the package to be eligible to receive the commemorative medal and free training guide – do NOT register for events individually. Note, if you choose to participate in the O’race Trinity Series and the new Spring Ahead: 5K to 10K series, you may do so only by following these directions: Register for the Spring Ahead: 5K to 10K series, register for the Courthouse O’Putnam 5K and the O’Niantic 5K as individual events. 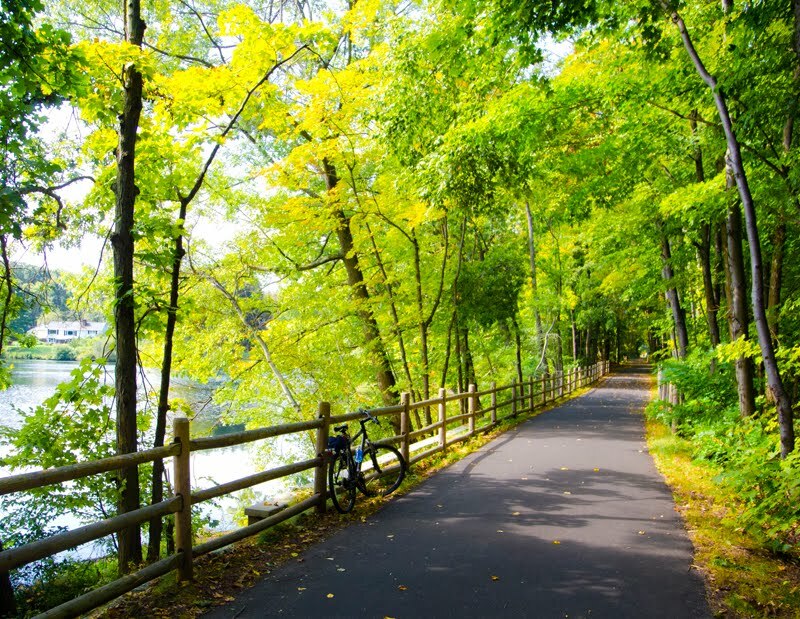 This is going to be a real beauty, 6.2 miles along the scenic riverside from Farmington to Collinsville. Course details are still being finalized but we will be limited to the first 800 runners and expect to sell it out. 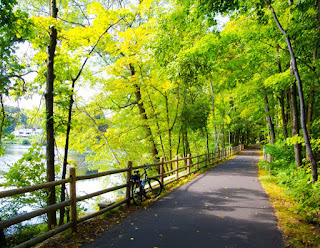 The multiuse trail along the Farmington River will be utilized, providing a flat, shaded course filled with scenic views. The finish in downtown Collinsville will feature a great post-race party hosted by the Collinsville Downtown Merchants. A custom water bottle will be included in your entry fee as race swag. Short sleeve cotton or tech shirt is available for purchase as well. We're excited to share the schedule of 2016 race series and promotions! Registration will open for these packages on Friday, December 11. General registration for events will open on Friday, December 18. In the meantime, the site will be down while registration details are loaded in order to open on those dates. Thanks for running with us - cheers to a great 2016! Get your Irish on! Register and complete the three O’races to earn event medals that link together forming the Irish flag - with a special Gaelic message! The Courthouse O’Putnam 5K (March 13), O’Niantic 5K (March 19) and O’Hartford 5K (March 20) are festive St. Patrick’s Day themed races – costumes encouraged! Motivate yourself to race more miles this spring! Run the O’Hartford 5K (March 20), Legends 4 Mile (April 3) and the NEW Collinsville Classic 10K (Farmington to Collinsville on May 1). Register for the series to earn a commemorative finisher medal and get a free training guide. Optional group training is also available. Are you up for the challenge? Run the Harvard Pilgrim Middletown Half Marathon (April 3), Mystic Half Marathon (May 15) and Eversource Hartford Half Marathon (October 8). Earn a newly designed finisher’s medal and exclusive HMF Triple Half Challenge jacket – note, you MUST register for the Challenge to qualify (do not register for each race individually). Enjoy the festive, themed Thursday evening summer 5K series with a brand new design on the big bling! You must register for the series (not individually for each race) to earn the bling. June 23 is a sports teams theme, July 21 is Olympics and August 25 is Super Heroes - beer, burritos and a blast of a run! Earn this impressive distinction by completing the People’s United Bank Vermont City Marathon on May 29 and the Eversource Hartford Marathon on October 8. Those who register for the Double and finish all 52.4 miles will receive a special medal (in addition to earning event finisher medals) and a commemorative NE Double jacket. We will help you accomplish your half marathon goal – whether it’s your first or fifteenth!! Run a July 5K (either the Red Dress Run for Women on July 9 or Rentschler Airfield 5K on July 14), and the Old Wethersfield 10K (August 28) and the Eversource Hartford Half Marathon (October 8). Register for the series (NOT the races individually) to earn a commemorative finisher medal and get a free training guide. Optional group training also available. Please help us reach the goal! It’s the final race of the season this Sunday and we have one more big job to do – but we need your help! Our goal for the HMF Can drive of 2015 is to donate 10,000 pounds of food to communities across the state. We are 1,600 pounds short of reaching that goal (and we really don’t like falling short on goals!). So – we did some simple math. We have about 2,200 people running with us at the Blue Back Mitten Run, presented by UnitedHealthcare. If half of the runners on Sunday bring just 2 cans each, we will meet the goal! Can you spare 3 cans of tuna? How about a couple boxes of pasta and jar of sauce? It doesn’t take much for us to make a difference if we all pitch in – pretty please!?! Help us help the people living in communities that we run in. 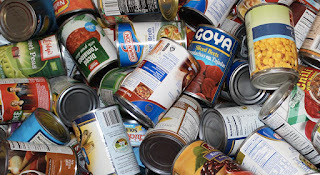 Bring non-perishable foods to drop off at the HMF Can trailer. As is our annual Mitten Run tradition, we will also be collecting new mittens, hats and scarves for the Town That Cares Fund.